DirecTV does not like people who jailbreak their devices and locks you out of their app completely if your device is jailbroken. 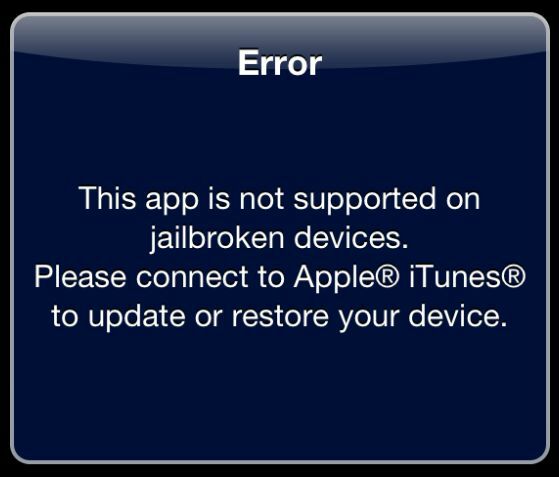 When you first open the DirecTV app (version 2.3.0) you are presented with the above error message: This app is not supported on jailbroken devices. Please connect to Apple iTunes to update or restore your device. Luckily Brandon has come to the rescue and created a patch so you can enjoy the new Directv app that supports live streaming. To patch your app you must have our Cydia repository installed. Open up Cydia and click on Manage at the bottom. Click Edit in the top right and then press Add in the top left. type http://beta.leimobile.com/repo/ and the press Add Source. Browse the LEiMobile repo and install dtvrunner. Once installed reboot and your Directv app will function normally. Anyone know if this works with the latest 2.4.1 version of the DirecTV app? I’m not going to update until I know this will allow my DirecTV app to still function. Thanks. We have not tested it yet, but you could always save your old app on your computer into a separate folder and install the new one. If it doesn’t work, just put the old version back on. I just updated to v2.4.1. The app still works. Thanks for the update, TKane. doesnt work on the ipad version of the app. Thanks. It worked great! Now we need an ipad version. Works great on the iphone. When will there be an ipad fix? The DTV app on my ipad mini is version 1.9.9. Do we just need to wait for DTV to upgrade the ipad version? Thanks for this fix. DTVRunner worked like a charm. The word on this app needs to be pushed out! Well I just JB my iPad and the DTV release 2200 does not work. Does anyone know where I can DL an old version? Thanks a million for this. Love sticking it to the man like that. Is this safe? I’ve always been warned not to download from repos other than default ones on cydia? Whoever made this is a hero! Works on latest DTV app. Thx! Works great for iPhone, doesn’t work for iPad unfortunately. WORKS ON IPAD MINI!!! Found an old version of direcTV by googling direcTV old version and this site was first on list. click and directed to iTunes. Works like a charm…SWEET! Finally! I already downloaded LEiMobile repo and install dtvrunner before downloading old version directv So unsure if the old version would have work without cydia apps. Don’t matter because I’m Back to watching Directv again….I’m so happy!! It works with 2.5.1 on iPhone 5.
for real? This was the only reason I was holding off jailbreaking. Thats so stupid, Directv thinks because your iDevice is Jailbroken your going to Pirate? LMAO. You all rock! My Saviors, I simply would die without this app! Confirmed to work on iPhone 5s, iOS v7.0.3 & current DirecTV app as of 1/13/2014. Thanks!!! However, you can run the iPhone app on the iPad and at least get that level of functionality. Better than nothing, on my iPad Air. Just tried with DirecTV App 2.4.5 on iPad Air running iOS 7.0.4. Fail. this worked on latest DirecTV app, iPhone 6 Plus, 8.1..THANKS! You can use Flex now to fix it.